I like interesting plants. Unfortunately, not all interesting plants are beautiful. I am also a bit of a collector when it comes to plants and I like to try new plants, so I can tell people about them. Variegated plants appeal to me too and variegated forms are certainly interesting, visually and botanically, though I accept that not all are improvements over the ‘green’ forms. 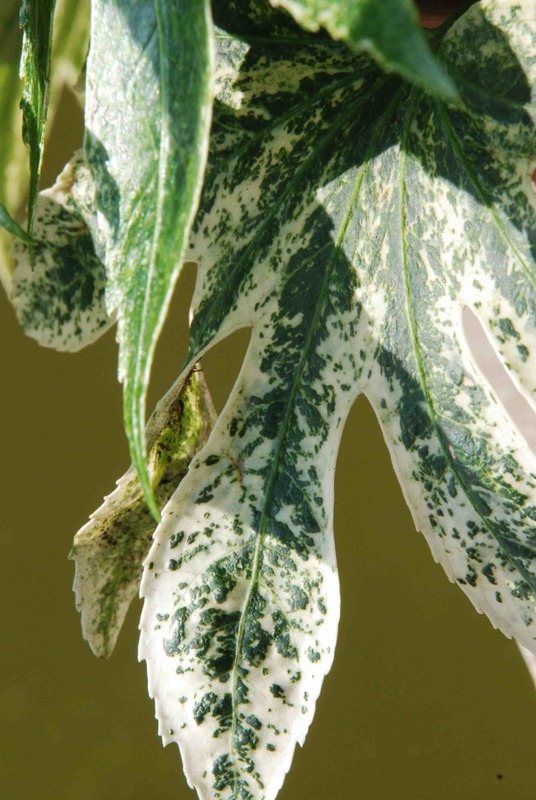 Variegated plants, as opposed to yellow-leaved plants, are usually not especially tricky but you have to remember that, because they have to support the white areas of tissue, which cannot make food and have to be supported, variegated plants are often slower-growing than their all-green cousins. Fatsia japonica is an interesting and beautiful plant. It can be used as a houseplant in a cool room and is hardy outside too, though the foliage of the plants when used in different ways is also different. When grown indoors the leaves are thin in texture and soft to the touch while plants outside have tough leaves like plastic. Closely related to ivy (Hedera helix) and in the Araliaceae ( a fascinating plant family), fatsia is a large, spreading shrub that, in time, makes a broad, large shrub 3m high and across. As well as being an architectural evergreen of handsome habit and form, it produces branched stems of spherical heads of starry, white flowers in late autumn. The flowers are showy because of the sheer number of them and they are a great nectar source for late bees and butterflies, as well as wasps and flies. So Fatsia japonica is an all-round good egg! 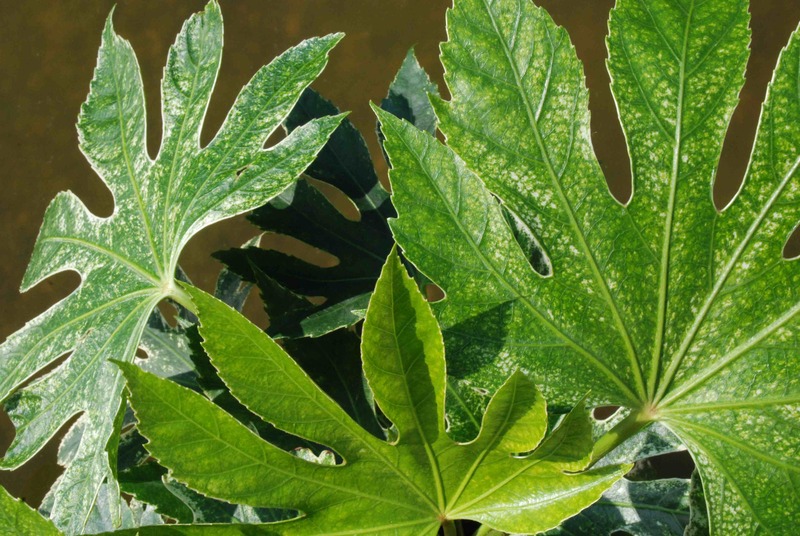 The standard variegated fatsia is a noble plant with thin edges, sometimes more, of creamy white. It is beautiful and the variegation is not too fussy. Which brings us to a rather special, ‘new’ fatsia. I had heard about this some time ago but now I have one of my own. It originated in Japan where variegated and curious forms of plants are admired and acquired. It is a selected form of an established seed strain called ‘Tsumugi Shibori’ (tie-dyed cloth). The plant we now have was selected by Dr Yokoi and Mr Hirose of Iwakuni in Japan and I have to say I don’t know how it compares with other plants in the seed strain but presumably it is a good form. Apparently Mr Hirose came up with the name of ‘Spider’s Web’ for this interesting plant and I wish he had thought of a better name. 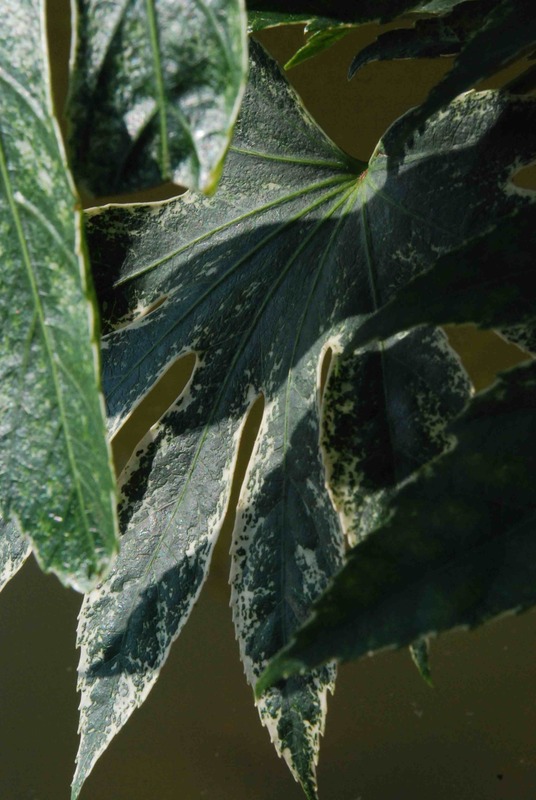 My problem is that fatsia, especially when grown as a houseplant or under cover, can be ruined by red spider mite, causing bleaching of the leaves and death of the young leaves. Anyway, I am not quite sure about the plant. I have seen photos of old specimens and they seem to look more attractive because the variegation seems to become more pronounced as they age. A small plant like mine has good variegation on the old leaves but the new foliage just looks like there is something wrong with it. When mature the leaves have a similar patterning to helleborus ‘Pacific Frost’ with random speckling that spreads to make white-ish areas, mostly around the edge of the leaves. I will keep mine in a pot while it is young and give it the best start. Like the plain green I think this will be best out of full sun. We will see if it grows on me after my initial excitement and current questioning about whether it is a beauty or a beast.